The Banh Mi Handbook: Recipes for Crazy-Delicious Vietnamese Sandwiches by Andrea Nguyen provides a foundation for making classic versions of banh mi as well as a source of inspiration for unique banh mi interpretations. It’s divided into recipes for the banh mi pantry, bread, condiments, main fillings which comprise the vast majority of the book. Recipes in the fillings ranging from cold cuts, pork and beef, seafood, and vegetarian fillings. The last section has alternative interpretations, encouraging experimental versions of bánh mì. It’s a relatively short book at 125 pages, but is packed with over 50 recipes. As Andrea Nguyen recounts in her book, years of sleuthing and month’s of bread baking was spent trying to replicate the Vietnamese baguettes found commonly in Vietnam. While we’ve eaten many good banh mi here in America, we’ve yet to eat a banh mi baguette as good as in Vietnam. Why is the crispy baguette crust that shatters when bitten and the airy crumb so common to Vietnamese baguettes, yet so elusive and difficult to replicate here in America? One prevailing notion on why Vietnamese baguettes are so unique was that it contained rice flour. All ingredients are mixed, dough divided equally, and then rolled into shape right away. The dexterity and speed of the bakers were simply amazing. We saw them literally roll about 100 baguettes in a matter of minutes. It’s starts by flattening the dough with the heels of your palm, then lifting the disk of dough and slapping it on the counter which elongates them to an oval shape. It’s then rolled into a final baguette form. They are immediately placed in covered proofing boxes and allowed to rise in the hot humidity of Saigon for about 3 hours, by which time they have more than doubled in size. Finally, they are slashed and baked in a steam oven. Mr. Hung explains how the cracks instantly develops on the crust after it comes out of the oven and that the characteristic airy crumb is called khong ruot (literally means no guts) to describe Vietnamese style baguettes vs. more dense compact crumb of western style baguettes. 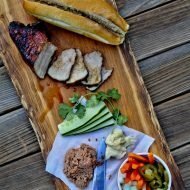 After our No Reservations/Anthony Bourdain like adventure, we left Mr. Hung’s bakery convinced more than ever that rice flour was not what made Vietnamese baguettes unique. Admittedly, we were somewhat disappointed that we didn’t discover some secret ingredient, but then again, it all made sense. 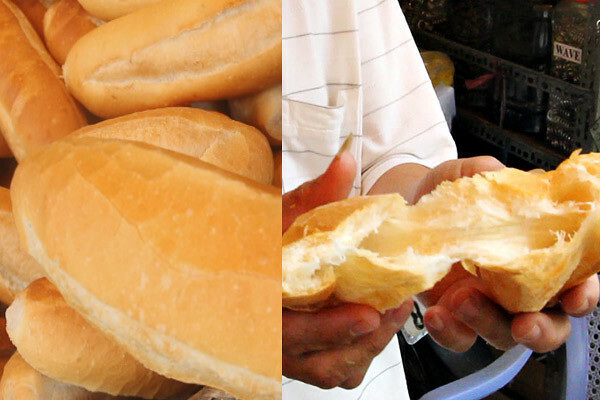 Why would the French, masters of baguettes, teach Vietnamese bakers to incorporate rice flour? 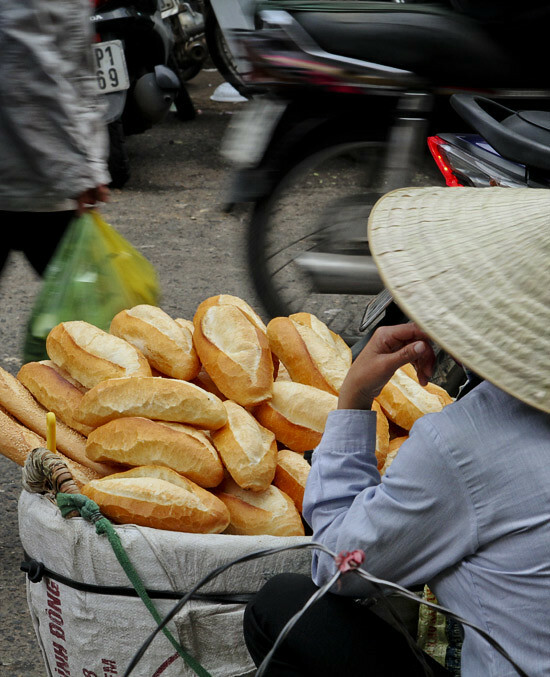 The Vietnamese bakers are basically using a basic French baguette recipe in Vietnam. 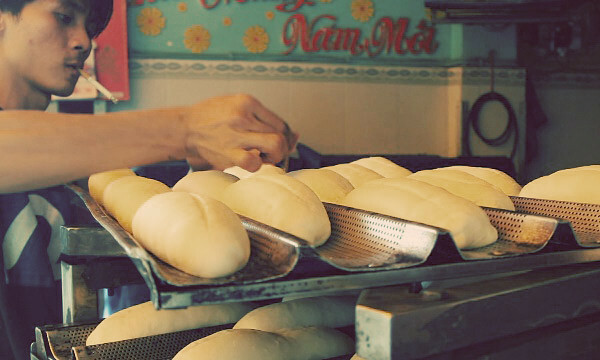 Perhaps its just the unique baking environment of Vietnam, the hot humidity and extended proofing that makes that incredibly airy crumb and crispy crust. Nguyen’s recipe for banh mi baguettes also reflects the fact that rice flour is not part of the recipe though it differs slightly from Mr. Hung’s technique. We’ve yet to try it, but we’re glad she has also dispelled the notion of rice flour as the secret to the Vietnamese baguette. 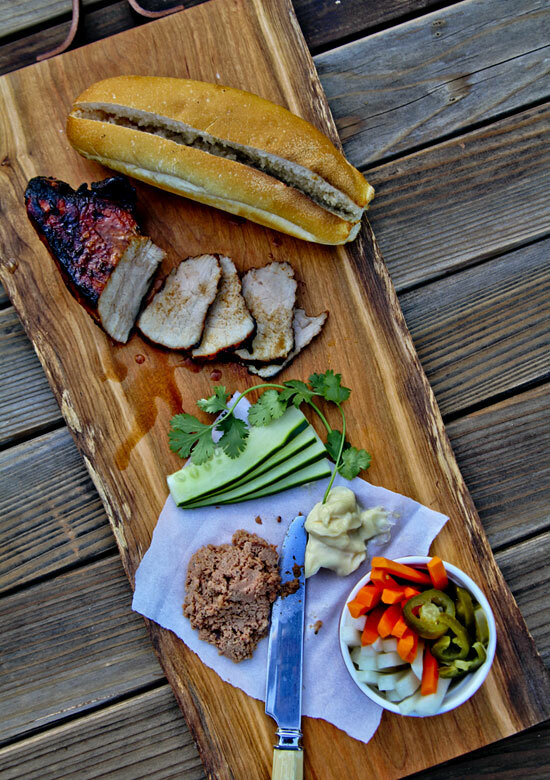 Reading The Banh Mi Handbook and it’s gorgeous photos did make us crave some banh mi and we were glad to see a recipe for five spice barbecue pork, thit xa xiu, was included. We love the sweet and sticky texture of xa xiu as it complements the sour pickles and richness of mayo and pate so well. It’s one of our favorite banh mi fillings. The flavors of the recipe are spot on and really like how all recipes has a “notes” section that gives tips on how it can be made into a banh mi as well as other possible variations such as a xa xiu banh mi steam bun. The only thing we would suggest differently is to reserve more of the marinade for glazing as there were plenty of marinade left and we like to slather it on during grilling. Cut pork into 3 chunky strips about 2 inches thick and 6 inches long. Set aside. In large bowl, combine the garlic, five spice powder, sugar, sesame oil, soy sauce, ketchup, and hoisin. Reserve 2 tbs of marinade for brushing. Add the pork to the marinade and coat well. Marinate for 1 to 24 hrs, turning 2-3 times. To grill the pork, set grill to medium. Lightly oil grates and cook for 16-20 minutes turing frequenly. During the last 5 minutes, baste with reserved marinade. Cool on coolng rack. If roasting, preheat oven to 475 and roastin top third of oven for 30-35 minutes. Baste with marinade every 10 minutes. Regardless of cooking method, the xa xiu should have a glazed look with charred exterior and internal temperature of 145F. Allow to rest for 10 minutes before slicing into banh mi. If you’re a fan of bánh mì, The Banh Mi Handbook: Recipes for Crazy-Delicious Vietnamese Sandwiches is for you. It’s well thought out, organized in a clear and logical manner, and contains lots of recipes and photos to stimulute your appetite and desire to recreate delicious classic banh mi or crazy new versions at home. If you are one of first 500 to preorder, you can get some free goodies including a temporary tatto, signed book plate, and from Redboat fish sauce salt as well! We received The Banh Mi Handbook free for review. Opinions are all our own. 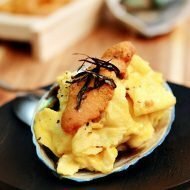 Uni Scrambled Eggs and Tet Give Away! Ooh I need this book! Your photos are beautiful!!! The special ingredient is the dough conditioner. It is a chemical product and could be made from a variety of ingredients including rice starch, soy ascorbic acid, monoglycerides, diglycerides, ammonium chloride, enzymes, DATEM, and calcium salts. Basically, you found your “magic”. Dough conditioners have been banned by Subway and other commercial producers. Basically, you found your “magic”. Just beautiful…how I love the old way of cooking. Sounds like quite a tour you got. He rolls out 100 baguettes in a matter of minutes… while smoking a cigarette. Only in Vietnam! Your banh mi looks legit, xa xiu happens to be my favorite–I’ll have to try making that sometime. Cheers! Wow!! 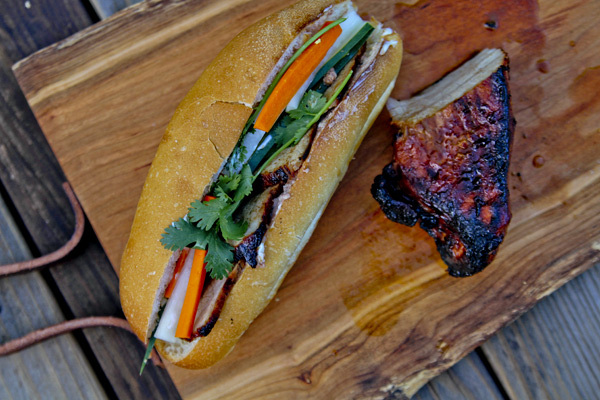 The banh mi looks incredible! Thanks for sharing the video too! My mouth was definitely watering watching them bake the baguette! Hi Kim, do you have a recipe on how to make the banh mi??? I am glad that I was not the only one that have been trying to figure out how Vietnamese baguettes are made. It has been a 10 years quest that have left me with a lot of failures. I have been lead down many bad roads listening to the internet. Over the years, I have pieced everything together and was able to achieved baking a Vietnamese baguette at home. 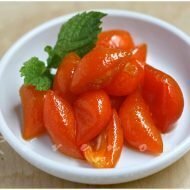 I have written out the technique and recipe and willing to share with everyone if I am allow to do it on this website. Wow, that’s a some dedication! Yes, there are lots of mis-information out there. We’re happy to see that you’ve had success. Send us an email, ravenouscouple@gmail.com to talk further! I really want the airy baguette recipe too. Can anyone share the ingredient ratios? Or email it to me mchlr@live.com thank you.